These non-rechargeable Dual-Lights use a CREE LED rated at 130 lumens paired with a high-efficiency deep parabolic reflector, creating a flashlight beam with an effective range of 181 meters (over 590 feet). Additionally, built into the handle is a 110 lumen floodlight. Unlike the flashlight beam, the light coming out of the floodlight does not have a reflector so the light spreads out in a wide, even, unfocused pattern of light...perfect for lighting up things that are close. Additionally, both the flashlight and the floodlight can be turned on at the same time for even more versatile lighting options. The waterproof design, in combination with an impact and chemical resistant engineered polymer housing, make these tough little lights, one of the best values around. Additionally, the integrated magnets located in the base of the handle and the pocket clip, provide for almost limitless hands-free usage. 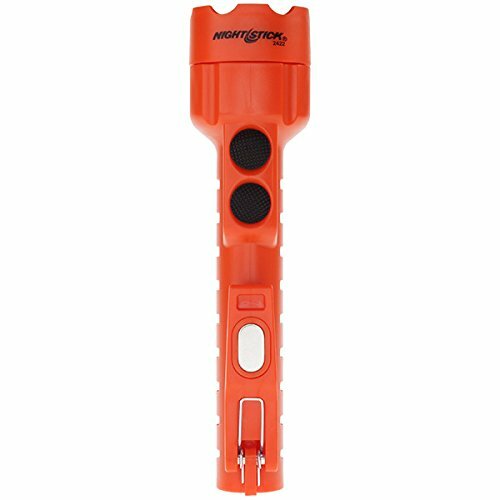 If you have any questions about this product by Nightstick, contact us by completing and submitting the form below. If you are looking for a specif part number, please include it with your message.